There are quite a few women who have made a name for themselves in the Indian political scene. Politics has been a man’s world for long in India and having the will to stand up against such a bastion, itself is praiseworthy. It must be said that some of them have taken the fight to the men and have even succeeded in beating them in their own game. Some of these women have been under the wings of some strong political strongholds, and some have grown from the grassroots. Either way, these women have inspired a whole new generation of young women in India, making the younger brood believe that they can carve a niche for themselves in the male-dominated political setting. Being born an Italian, Sonia Gandhi has been more popular in her adopted country, India. Having married the first son of the then Prime Minister Indira Gandhi, her political entry wasn’t predicted until the demise of her late husband, Rajiv Gandhi. Though she has been in the most influential position to command the most popular party post-independence in India the Congress I, she hadn’t held a position of significant importance as an elected member. Her duty to the adopted country was well received when she named a senior veteran in Dr.Manmohan Singh for prime minister when she could have taken the chair herself. Her bold face post the assassination of Rajiv Gandhi and her ability to lead such a big party has her in good stead among women of the country. Being a member of the BJP and the first women Chief Minister of Delhi, Sushma Swaraj has carved a name for herself. As a former Supreme Court lawyer, Ms.Swaraj has quite a reputation for being successful in her black robe. She is the second Indian women to become the External Affairs Minister of Indira Gandhi. As the current external affairs minister, she has taken some bold steps in external affair policies of the country. In situations that demanded immediate action, Sushma Swaraj hasn’t hesitated in taking crucial decisions saving the lives of many an Indian living abroad. Wall Street Journal has named her as the Best-loved politician in India. Kanimozhi, the daughter of the former Chief Minister of Tamil Nadu, is a poet, journalist and a politician all enrolled into one. Being the daughter of the DMK’s premier, Kanimozhi has inherited his literary skills as much as the political supremacy that her father possesses. She has often been quoted as the literary heir of the leader. She was active as a journalist and was a steady contributor to a Singapore based Tamil daily called Tamil Murasu. Her vested interest in Tamil brought her close to her now husband and pillar of strength G.Aravindaan. Kanimozhi conceived the idea of the Chennai Sangammam which had given a helping hand for the folk tradition of Tamil Nadu. This Tamil cultural festival is usually held during the Pongal Season. 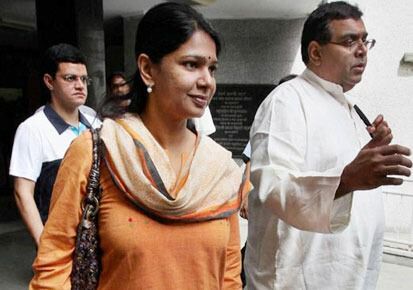 Kanimozhi is the sitting member of the upper house of Parliament and has voiced concerns for Tamil and Tamil culture across the lengths and breaths of the country.